My friend and co-author of my book, Pierre, was born and raised in Cap-Pele and went to high school in Shediac, which is the self-proclaimed lobster capital of the world, and so that made these spots of particular interest to us. 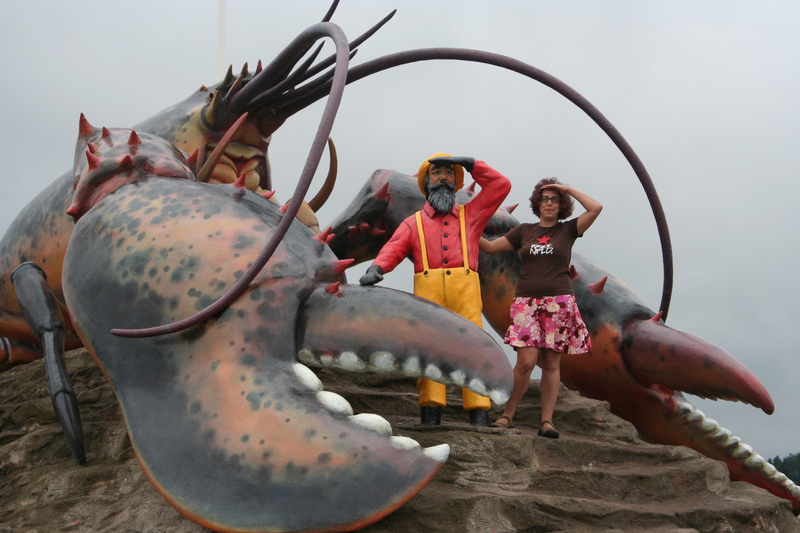 Shediac has a giant fiberglass lobster which we enjoyed playing on and taking pictures of. 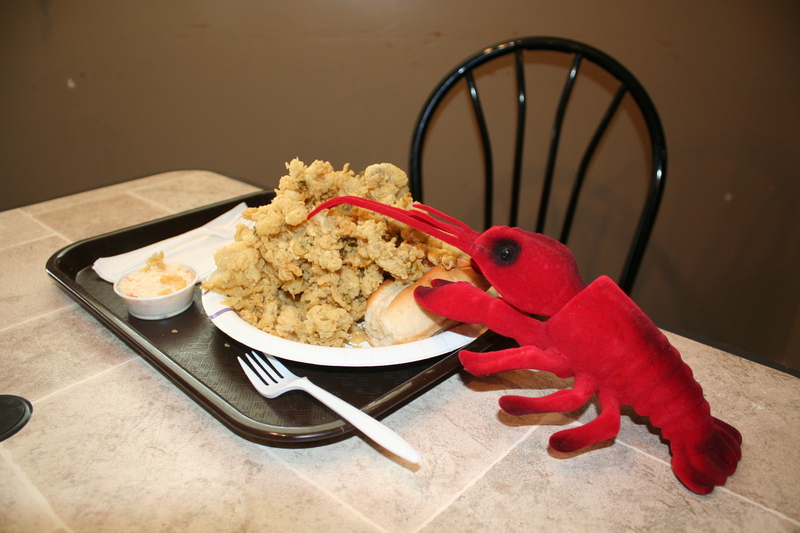 We even bought a velvet bobblehead lobster there for our dashboard, which we christianed Joseph-Pierre, after our Shediac inspiration. Pierre had directed me to eat somewhere near there, but I couldn’t remember where. It was on our Google Map, but how to get online to see it? There were no internet cafes and while the people at the Welcome Centre didn’t mind if I used their computer, it wouldn’t let me log in to my Yahoo account. (With Google Maps you can customize a map, and Step and I had one showing where our friends across Canada were, our boat reservations, and places of interest to see. With this useful tool a rough route had become obvious to us before we left. Step also uses this tool to do the “route” page on this blog, but because of limitations to the program, and because he must be online to do it, he’s a little behind schedule on that project). 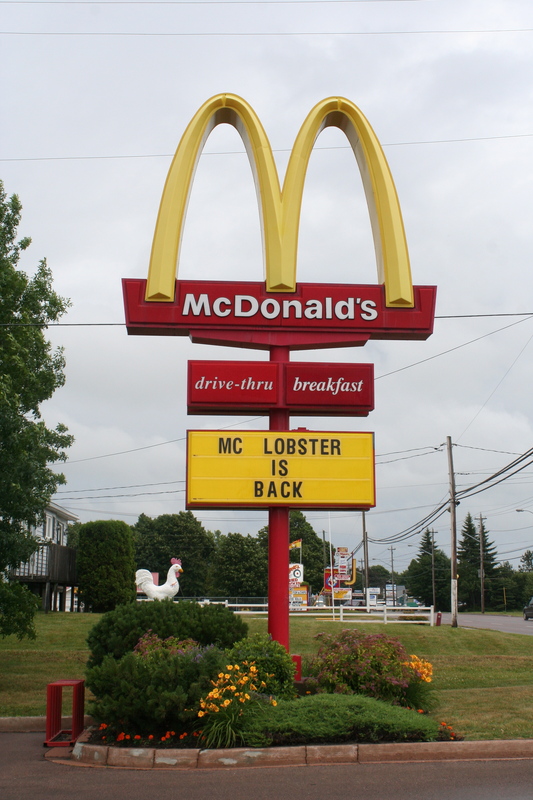 We went to the McDonald’s parking lot to see if we could pick up any McWiFi, and I saw their sign said “The McLobster is Back”, which I laughed at the absurdity of. When I went inside to inquire about WiFi (they didn’t have any) I asked about this McLobster (McHaomard for the Francophones), and it turned out to be a regular summer McFeature all down the east coast. Curious and amused as I was, I decided not to try it, because I’m a foodarian and only eat fast food rarely. We picked up some WiFi signal from a nearby motel, and how I wish I could remember the name of it because we went into the office to ask for their password and the couple who own the motel were so nice to us we ended up chatting with them well over half an hour. They told us town gossip, like how the Visitor Information Centre wasn’t allowed to recommend any restaurants to us because one of the kids there had been sending EVERYBODY to Captain Dan’s, even when they were looking for somewhere fancy. They also showed us pictures of their kittens and honeymoon and stuff. Captain Dan’s is a big barn like restaurant on the wharf where people go for pints and piggy portions of pub food. It came up so often in conversation we went there directly after and each had a very good lobster roll. While there we suddenly realized we had been so preoccupied with our awning situation we had forgotten to go to the Magnetic Hill while we were in Moncton. 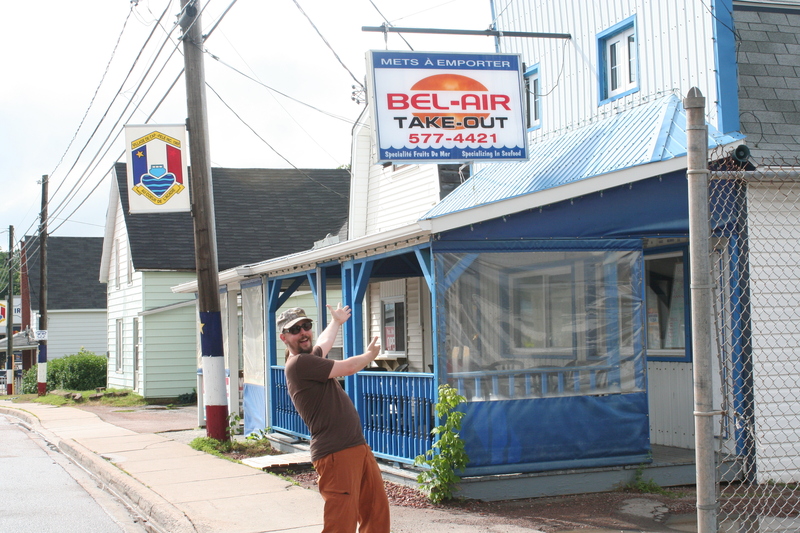 It turned out where Pierre had demanded we go was Bel-Air takeout in Cap-Pele for fried clams. Cap-Pele is nearby to Shediac and we were already full of lobster but we ordered the fried clams anyway, because we had to, and it was a giant pile. They were good, too. The Bel-Air has all sorts of awards for fried clams. 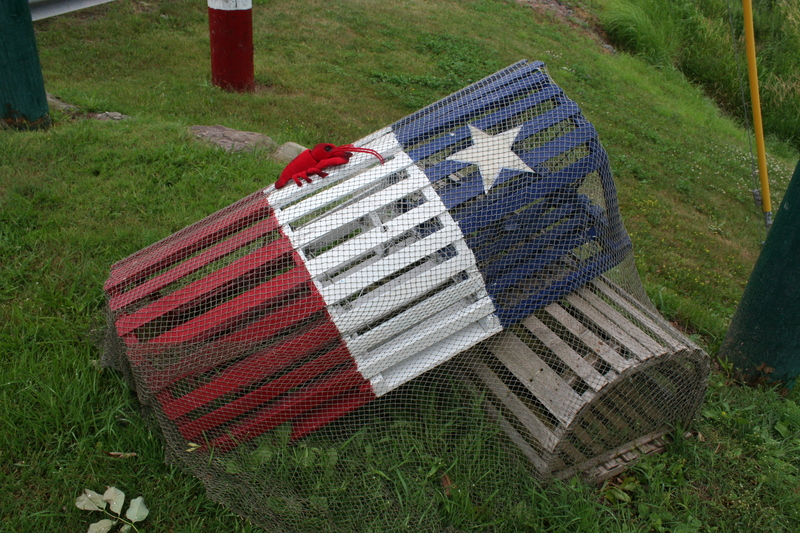 We also purchased an apron made out of an Acadian flag for a gift for Pierre. The surprise will be spoiled if he reads this blog, but I bet he’s just looking at the pictures. The weather was finally getting sunny and we decided to pop by the beach before we went across Confederation Bridge to Prince Edward Island. There’s a super popular beach near Shediac, Parlee Beach, but we went to a lesser know beach, Murray Beach, and then I knew why people love and vacation in New Brunswick. That beach was totally bitchin’! I mean in a good way, sandy and grassy and with blue water and beautiful cliffs (I’m sorry—for some reason we forgot to take the camera to Murray Beach so you’ll have to use your imagination). While sitting at the beach, I felt we had been really unfair in our attitude towards New Brunswick, and would have been happy to spend the night there, but the beach is so close to P.E.I. 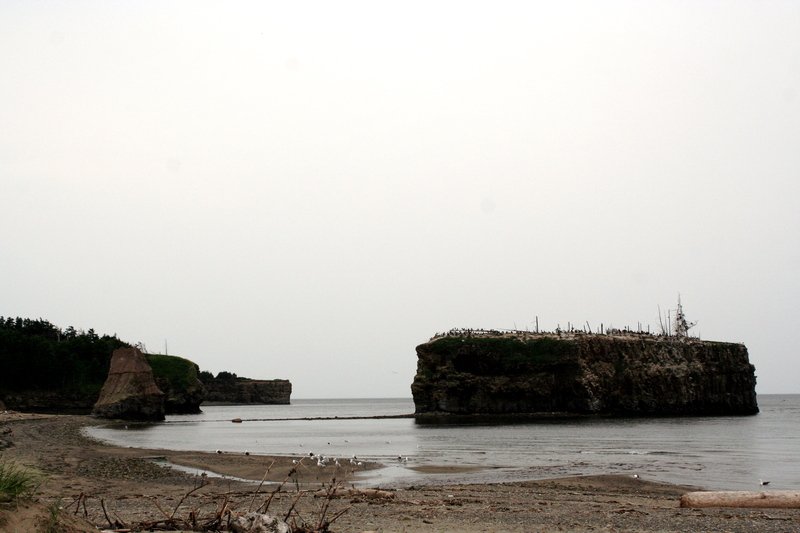 and it was still early afternoon so we decided to move on to our next Maritime province. Even at the time we knew we weren’t giving New Brunswick a fair shake. Before we got there I had jokingly referred to New Brunswick as the overlooked province, and Step had admitted he had been unable to rustle up any interest in it. We knew the Bay of Fundy and Digby Peninsula might be spectacular, but we wouldn’t be anywhere near them. The first stop when we got off the bridge connecting the uninspiring province to Quebec was the information centre in Campbellton. To me, the most interesting brochure was a flyer advertising you could go to these peoples’ house and have an Acadian evening with them, including a lobster dinner and music in their living room. We couldn’t go because of course you needed an advance reservation, but it’s kind of quirky you can pay them to host you for an evening. (The flyer showed everone being served plates with 2 lobsters each, which seems kind of excessive. I can barely make it through 1). We went to a nearby pub for lunch where we were served a terrible basket of previously frozen shrimp with what tasted like seasoning salt on them, a real disappointment after the uber-fresh and tasty seafood of the Gaspesie. 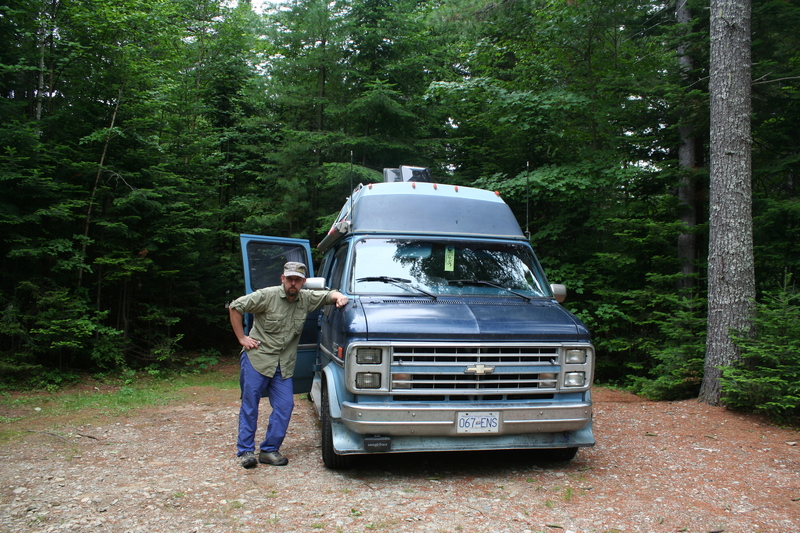 Our plan was to go to Moncton lickety-split and have the awning repaired at an RV centre. It was already early evening so we knew we wouldn’t get there until the next day. Step wanted to take the direct route down the freeway, but I lobbied to mosey around the Acadian Coast. There was really no reason not to, so we did. I suppose if the sun had been shining the coast might have looked beautiful, but it wasn’t. 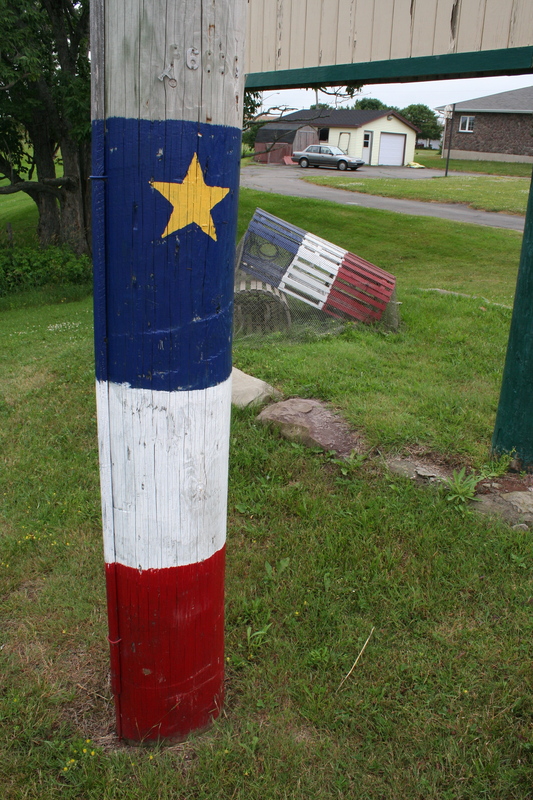 There were a lot of things painted with the Acadian flag, including the telephone poles. The houses were less colourful and more run-down than those on the Gaspesie. It looked like the people were kind of struggling. 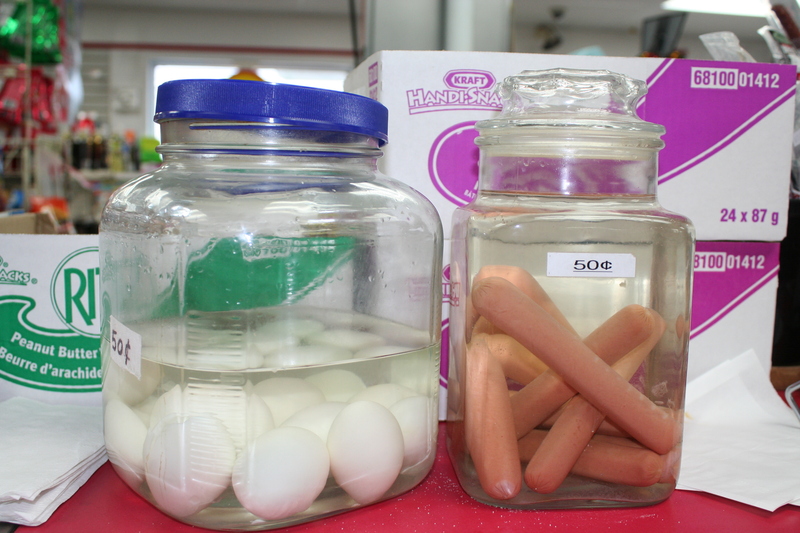 We stopped for propane and I noticed the convenience store had wieners in brine or water for 50 cents as a snack option. We did stop at one place I thought was beautiful; a little beach near Grande Anse called Pokeshaw Community Park, but as it wasn’t beach weather we didn’t stay long. In the absence of any local connections for input, we often turn to the Lonely Planet travel guide for advice on where to go. Even though the Canada edition we have is 3 years old the majority of times it steers us in the right direction. Step had read about a campsite near Miramichi called The Enclosure which had a pub called Flo’s in it where there was live music, so we went there. Sadly, Flo’s wasn’t open that night, so we had to scratch together a dinner from odds and ends in the Boogie Bus and listen to the iPod. We had purchased firewood from the front gate which was so damp we just couldn’t keep it going, even though I tried and tried to make a fire. The bathrooms at the Enclosure were the worst I had seen—old, buggy, and not very clean. I guess the one nice thing was the campsite itself was beautiful, being forested with copious tall and densely foliaged trees. And we got our laundry done. The next day during our drive to Moncton there was a rainfall that was one of those ones with really big raindrops, if you know what I mean. When we got to the RV place it was really crowded and the many staff people were harried. One of them explained it was the busy season, came out and glanced at our awning, still packed in it’s casing, and instantly proclaimed it would take 5 weeks to get the parts needed (WTF?). By this time Step and I had examined and discussed the awning so much we decided we could do the job ourselves, and purchased some awning tape and sealant and went on our way. (To get quite ahead of myself, and to not keep you in suspense, over the next 10 or so days we did a very good repair job ourselves, indeed the awning is more secure and waterproof than it started out as, and we use it often but always take care to secure it to the ground).